Grid-Interactive and Stand-alone capability in the same package• 8000 Watts of continuous power• Unsurpassed surge capacity• 120/240V split-phase voltage• Dual AC inputs• Field upgradeable firmware• Field serviceable modular design• Simplified parallel design allows easy installation of systems from 8 to 80kW• GS Load Center option allows for quick and easy installationThe new OutBack Power Technologies Radian Series GS8048A-01inverter/charger provides a comprehensive answer for grid-interactive and stand-alone power systems. 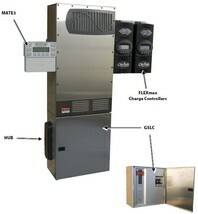 Based upon a proven foundation of reliable technology, but engineered from the ground up to simplify the design, distribution, installation and implementation of energy storage, the standardized structure and integration with the GS Load Center make it easy to provide a successful solution to any power requirement, anywhere. Complete system interface using the OutBack MATE3s and HUB Communications Manager enables the Radian Series GS8048A-01 to be connected with other OutBack Power electronics providing industry leading integration and a robust, scalable power solution. Up to 10 units can be connected in parallel for systems up to 80kW continuous power output.